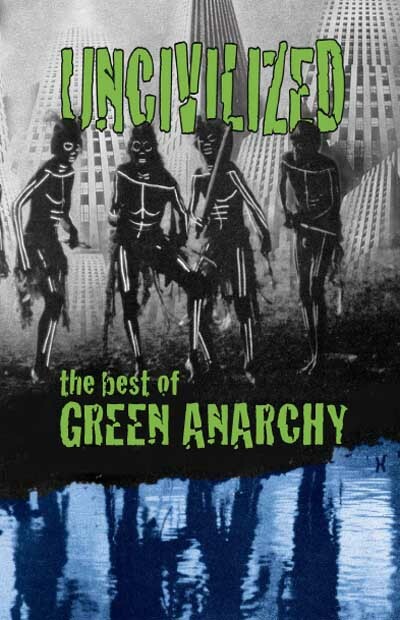 Green Anarchy was begun in Eugene, Oregon in 2000 by Saxon Wood. After the first four issues, Wood handed the publication over to a group of rowdier, less traditional anarchists. In its time, from issue #5 through #25, 2001–2008, it matured into an explicitly anti-civilization zine. The subtitle, “An Anti-Civilization Journal of Theory and Action,” was added as of GA #13, but that orientation was actually on offer from the new editors’ very first numbers. I came on board after about a year. Writing, editing, fundraising, and mailing the zine were my main emphases. GA had at one time, briefly, seven editors; the usual number, as I recall, was four. A couple of things stand out for me. The hostility from the Left, and from leftist anarchists in particular, was pronounced. GA became a substantial anarchist periodical, easily one of the most important in English, world-wide. And yet AK Press, noted “anarchist” publisher/distributor, refused to ever carry it. This was shocking, given the number of liberal, authoritarian, and other non-anarchist titles AK has always stocked. This outfit, like others on the left, was clearly threatened by our effort––especially our critiques of mass society/mass production, Progress, industrial life and the like, as well as of domestication/civilization. The other thing, the other side of the coin, one could say, was GA’s popularity, its levels of support from seemingly growing numbers of folks who saw the importance of the radical questioning that GA represented. It wasn’t very long before each issue cost about $6,000; $3,000 for printing, and $3,000 for our quite extensive domestic and overseas mailing list, including a free copy to every prisoner who requested a subscription. What seemed an enormous sum to us was somehow always covered, as if by magic. There was a desire for GA, and widespread backup from quite a number of folks. As the decade moved along past the anarchy heyday in Eugene, 1998–2001, GA grew to almost 100 pages per issue. But it appeared less often, moving from quarterly publication to two issues a year. In 2008 the last four of us editors called it quits. But green anarchy/anti-civ/anarcho-primitivism certainly hasn’t gone away. On the West Coast new zines like Blackout and Eco-Anarchies are in the works or have already made their appearance. Not identical to GA, fortunately, but certainly anti-civilization in outlook. And Species Traitor has resumed, with a most impressive issue #5. Green Anarchy is dead, long live green anarchy!